Pneumonia is the leading killer of children under 5 globally. Approximately one million children die from pneumonia each year, and most of these deaths happen in low- and middle-income countries. Cammie Lee, program director for R4D's market shaping practice, breaks down R4D's approach to market shaping and how we're applying it to our work in health, education and nutrition. Highly effective and affordable treatment exists, so why aren’t more children receiving it? The reason is access. Since 2015, Results for Development (R4D) has been working alongside the national government in Ethiopia and a variety of other partners to make childhood pneumonia treatment more accessible in Ethiopia — where more than 30,000 children under 5 die every year due to pneumonia. Though there’s more work to be done, our team and local change agents have made enormous progress and would like to share three insights from our experiences. 1. A holistic market approach is important. There are several factors affecting access that prevent lifesaving medicines from reaching the people who need them. In the case of amoxicillin dispersible tablets (amox DT), the WHO-recommended treatment for pneumonia, there were several regulatory, demand, supply and financing issues in Ethiopia that all needed to be addressed. For example, the national regulations around the use of amox DT had to be updated to ensure that it can be purchased and prescribed by health care providers such as physicians, health officers, nurses and pharmacists. To address this, R4D supported various country experts and stakeholders to include amox DT on the Essential Medicines List (EML) and as the first-line treatment for childhood pneumonia in all national treatment guidelines, such as the Integrated Management of Neonatal and Childhood Illnesses (IMNCI) and Community Based Neonatal Care (CBNC). These changes enabled the procurement of the medicine and prescription by health care providers at hospitals, health centers and health posts. R4D also discovered that in 2015, amox DT was solely funded and provided by donors and was only distributed to the health posts, the lowest tier of the health care system in Ethiopia. In addition, past efforts to quantify demand for amox DT were accounting for needs at the health posts only, and excluding patients going to health centers and hospitals, where majority of care-seeking for pneumonia occurs. Therefore, R4D along with various partners supported the government to improve the accuracy of its forecast by using a more robust methodology as well as leveraging existing data (e.g. number of cases of pneumonia). While updates in guidelines and appropriate forecasting were critical in supporting the government to procure accurate quantities of the medicine, R4D also simultaneously worked to ensure that there was an adequate number of suppliers in the country. To achieve this, R4D supported incentivizing high-quality manufacturers of amox DT to register their products in Ethiopia, by sharing market sizes and trends, as well as information about the registration process. This contributed to five high-quality amox DT manufacturers’ product registration in Ethiopia in just a few years; prior to these efforts, there were no amox DT products registered in the country. But the work doesn’t stop there. When guidelines are updated, forecasting improves, procurement mechanisms are in place and adequate suppliers exists, there are still several other things to consider — like improved supply planning and distribution, as well as ensuring that there are sufficient and sustainable sources of financing available to procure these life-saving medicines. R4D has thus been working in partnership with the government of Ethiopia to address these bottlenecks as well. 2. Coordination among many partners is key. There are several actors, both local and international, that play an important role in ensuring that lifesaving medicines, such as amox DT, are available at critical points of care in Ethiopia. This includes organizations and agencies that are responsible for the procurement and supply chain of medicines such as the Federal Ministry of Health (FMOH) and the national procurement agency — Pharmaceuticals Fund and Supply Agency (PFSA), as well as implementing partners that are working on health programs. However, sometimes these partners aren’t able to coordinate as closely as possible, which can result in breakages in the process and ultimately stock-outs of essential medicines. To create such linkages between partners, R4D, in close collaboration with FMOH, PFSA and other implementing partners formed the Child Health Technical Working Group (TWG). This has been a significant step forward, as all partners can come together to discuss progress and key challenges in the provision of child health commodities and services, as well as develop and implement solutions to address any bottlenecks. For instance, when R4D started working in Ethiopia, there were gaps in information on the flow of amox DT through the supply chain, including current levels of amox DT stock at various parts of the health system and amox DT needs across woredas (districts) in Ethiopia. Through this TWG, we coordinated with an implementing partner who was collecting data on stocking rates at health facilities to share this data with PFSA. This data allowed PFSA to appropriately quantify how much to send to each woreda based on existing stock-levels at health facilities. Such coordination has thus helped to support consistent availability of amox DT at critical points of the health care system. This is just one example of how R4D has supported coordination amongst several partners. We’ve found that such coordination mechanisms are critical, as these ensure that we are building on existing efforts (and not duplicating activities), as well as allow for strong local change agent ownership of the process, which ultimately will enable sustained increases in access to essential medicines. 3. Sustainable financing and enhanced country capacity are critical for long-term gains. A key focus of R4D’s work has been to enable government-led resource mobilization and prioritization to ensure sustainable financing of these commodities. In 2015, the Ethiopian government faced an imminent financing cliff for amox DT, as previous donor funds were nearly depleted. To address the financing gap, the Bill and Melinda Gates Foundation provided catalytic funding for amox DT over a multi-year period, while supporting activities that would enhance the capacity of the Ethiopian government to mobilize funds and lead management of all aspects of amox DT procurement and distribution. To that end, R4D supported the government in developing a funding gap analysis based on the improved forecast, to be included in the government’s budget process so that resources would match the forecasted need. R4D also conducted an analysis in close partnership with the FMOH that demonstrates the high return on investment for amox DT — which the ministry plans to use to advocate for more domestic and international funds. As a result of these efforts, the ministry mobilized and allocated both domestic and donor funds that fully covered funding gaps. Simultaneously, R4D along with many partners is helping to enhance country capacity to ensure sustained availability of amox DT. As mentioned earlier, amox DT, along with majority of other child health commodities in Ethiopia, were mostly donated, procured and distributed through non-government channels, such as international development organizations — rather than integrated through government systems. At R4D, we believe that such integration is critical to achieve long-term gains. To ensure that government systems are leveraged to procure amox DT, R4D provided technical assistance to PFSA with processes such as amendments to bid documents, initiation of tenders, management of contracts with manufacturers, and clearance procedures, to ensure that donor-funded amox DT is procured and delivered in a timely manner. As a result, R4D’s technical support in addition to the competition generated by having several high-quality manufacturers registered in the market, led to PFSA independently procuring amox DT from 2016 onwards. Lastly, while our work has been focused on amox DT, we’ve also been conscious of using childhood pneumonia as a platform to address similar challenges that cut across all child health medicines, and as an entry point to strengthen systems more broadly. 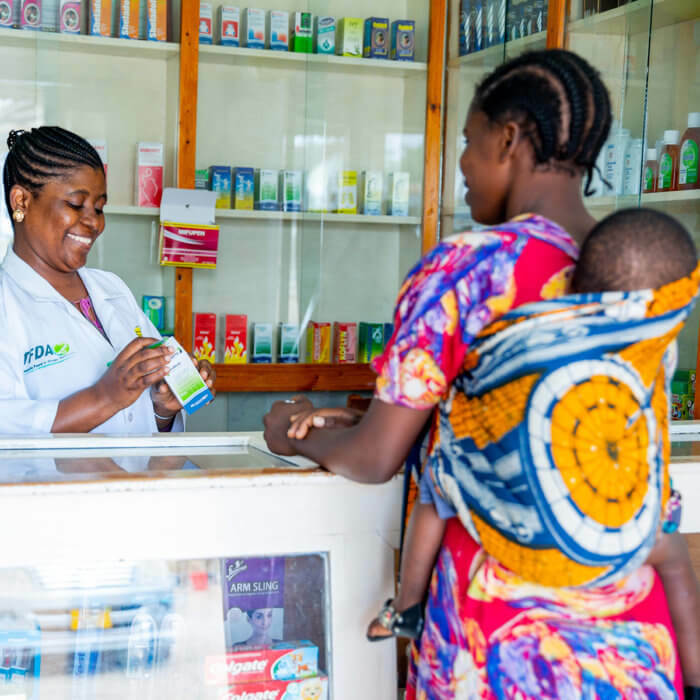 For instance, R4D leveraged the Child Health TWG and worked alongside several partners to support the integration of several child health commodities into PFSA’s National Integrated Pharmaceuticals Logistics System (IPLS), a unified supply chain system that connects all levels of the supply chain. Previously, these treatments were being procured through parallel supply chains, making tracking and distribution difficult. Because of integration efforts, health facilities can now directly order child health commodities through IPLS and track stocking levels consistently, thereby improving availability of multiple pediatric medicines. We are hopeful these combined efforts will dramatically accelerate progress to strengthen Ethiopia’s health system and ensure all children live past their fifth birthday.